Saturday May 25th 1878 We were late getting the work done. I helped with the house-work till noon. In the afternoon I sewed on Lee's shirts. In the evening went to Minnie White's reading. We all enjoyed it very much. 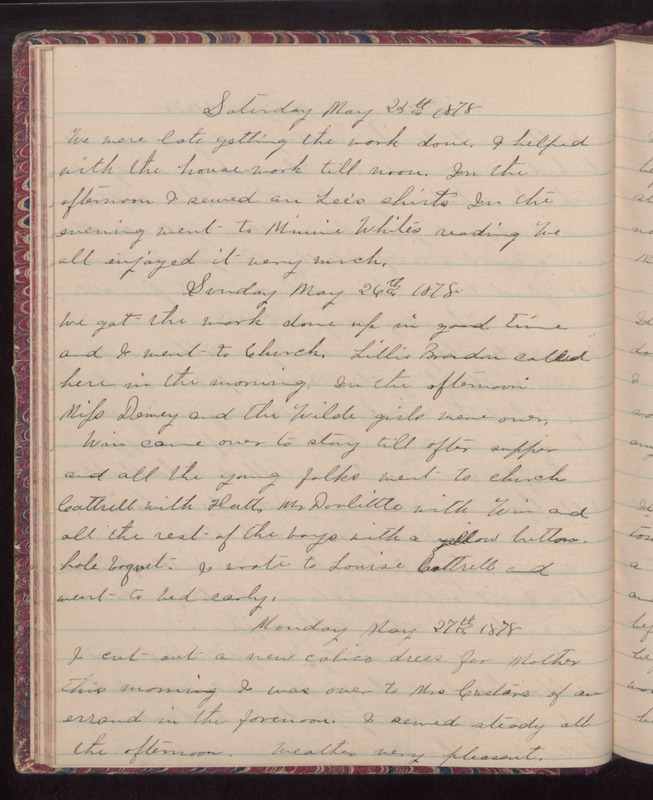 Sunday May 26th 1878 We got the work done up in good time and I went to church. Lillie [Bradon?] called here in the morning. In the afternoon Miss Dewey and the Wilde girls were over. Win came over to stay till after supper and all the young folks went to church. Cattrell with Hatt, Mr Doolittle with Win and all the rest of the boys with a yellow button-hole boquet. I wrote to Louise Cattrell and went to bed early. Monday May 27th 1878 I cut out a new calico dress for Mother this morning. I was over to Mrs Custors of an errand in the forenoon. I sewed steady all the afternoon. Weather pleasant.